Inconsistent decision-making, piecemeal and ad-hoc governance is what people get irate about and it does not matter if that is at federal or state level or at local councils like Fremantle. I had to laugh out loud this morning when I read a comment by Premier Colin Barnett on why SCITECH does not want to move to Burswood. “They would prefer better transport than Burswood and that makes sense” the Premier said. This is the same premier who insisted on putting the new stadium at Burswood so his mate Packer can benefit from it and who will build a new train station there, and who just announced a $ 54 million footbridge from East Perth to the Burwwood peninsula. But that is not enough for Scitech. You must be kidding me! On another note, did anyone in Fremantle Council try to get Scitech to move to Freo? Did Sirona consider and approach them to set up in the MYER building? Fremantle needs more things to do for tourists so what is the Economic Development Department actively doing about it, apart from supporting a wave power gimmick at well-visited Port Beach? ARE POLITICIANS ARROGANT OR JUST DEAF? The word arrogant is one of the most (over)used words when the public is asked for an opinion about politicians, be that local, state, or federal. 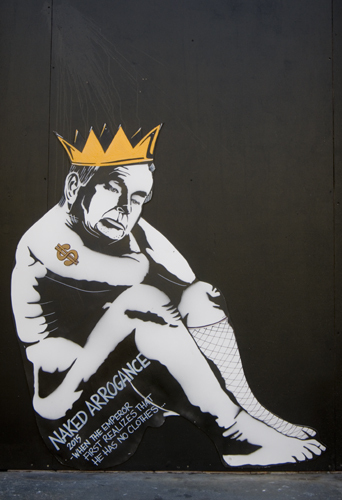 John Howard and Kevin Rudd were considered to be arrogant, as was WA formerPremier Alan Carpenter and present Premier Colin Barnett. In Fremantle the entire Council gets accused of being arrogant because residents believe Elected Members no longer listen to them and run their own agendas. I have met many local, state and federal members and have yet to meet one whom I would classify as arrogant. Aloof, self-righteous, blinkered, one-eyed, out of touch, yes, but arrogant they are not. Lessons need to be learned though from what happened in Queensland on Saturday and Tony Abbott’s lack of consultation with backbenchers and the community. When voters believe elected members have stopped listening to them they get very irate and abandon even the parties they prefer. P.S. Interesting to read State Government is investing some $ 40 million on a new Mandurah Bridge when all the Fremantle railway bridge is getting is a few venders to stop ships from bumping into it. Not happy, Colin! Comments Off on ARE POLITICIANS ARROGANT OR JUST DEAF?